Mrs. Thomas' Teachable Moments: A Little Tip for Free Money! A Little Tip for Free Money! I want to let you in on a cool feature of TPT that many people don't know about! Did you know you earn TPT credits for purchases on TPT? All you have to do is give the purchase a fair rating and TPT gives you credits to use on other purchases! The picture below is available to download for free in my store. You can zoom in on it and see exactly how easy it is to get the credits you have earned! 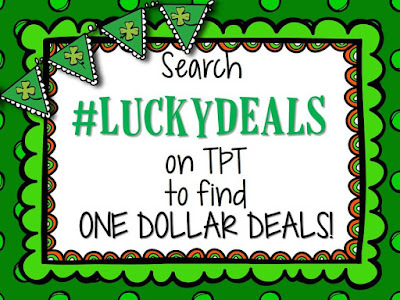 Also, March 16th - March 17th, if you search #LuckyDeals on TeachersPayTeachers, you will find tons of resources on sale from many sellers for $1.00! Click below to be taken to my store! Thank you so much for sharing this helpful information! It’s amazing that you can shop at TPT and earn TPT credits which you can use for other purchases. Actually, I like to get to know such a small but helpful hints which help to save money. We live in tough economic times and frugality is what we have to learn. I use many different tricks that help me to save money. Sometimes I use payday loans with quick approval to make ends meet so I use coupons and keep an eye on sales to stay in frames of my budget.